The bees are as busy as ever trying to build their pollen empire. Click here to play! See if you can help these buzzing insects for a chance to win a golden fortune! All bees know that the objective is to keep an eye on the queen, and this game is no exception. You'll want to spin this royal bug as she acts as a wild symbol and will payout up to 6000 times your line bet if you can spin her five times across an active pay line. You'll also need to spin plenty of Guard Bees to ensure that this empire is well protected. Spin these robust bugs three to five times across a pay line and you'll bring in up to 1000 times your line bet. Nurse and worker bees also pay out with the former bringing in a top prize of 800 times your line bet and the latter grabbing up to 600 times your line bet. Royal Jelly, honey, honey combs, pollen puffs, and bees wax will also pay out, so keep an eye out for these symbols as well. This hive has the addition of a scatter bee. Maybe you've never heard of such a thing, but be sure to collect as many of them as possible as these are scatter symbols and will multiply your total bet. You'll also want to take special care of the Babees as these little bugs are a bonus and will trigger a feature in which you can play for even more chances to win! 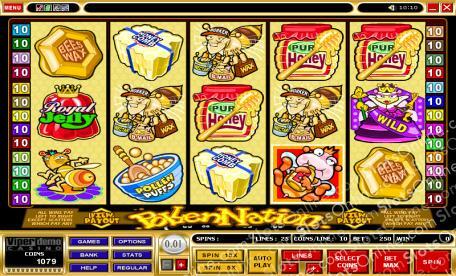 So, get down and dirty making plenty of honey in this buzzing slots game! The Scatter Bees are scatter icons and will multiply your total bet by 5, 20, or 80 if you can spin three or more anywhere on the screen. The Queen Bee is a wild. Not only will she substitute for most other symbols (excludes scatters and bonuses), but she will also pay out up to 6000 times your line bet if you spin two or more in an active pay line. The BaBees are bonus symbols. Spin three or more anywhere on the board and you will trigger a feature in which you will choose from a selection of honey cells to reveal your prizes. You continue to pick, building up your bonus, until you pick a 'Stop' honey cell.